13th Year for Air-land & Gary Christopher supporting St. Jude - Air-Land Transport Service, Inc.
Over the week of July 29th 2019, our COO Gary Christopher, will participate in the St. Jude Memphis to Peoria Run. This is the 13th year that Gary and Air-land Transport Service, Inc. have supported St. Jude. About 200 runners cover 465 miles in 4 days running from Memphis, TN to Peoria, IL. At the same time, groups of other runners from all over Illinois run to Peoria from 36 other locations. 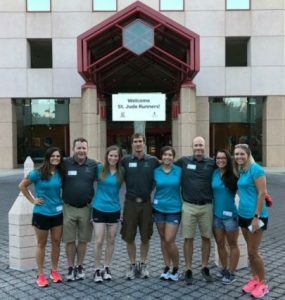 On that Saturday, tired and exhausted, they meet in Peoria and cross the finish line August 3rd live on the St. Jude Children’s Research Hospital Regional Telethon. Air-land Purchases New Wabash Trailers.